Art historians by nature spend a great deal of time “in a pocket of the past,” to borrow a phrase from Edmund Wilson. This might account for my reading Misia Sert’s biography four times, except for the fact that she is so interesting. Because Misia’s portrait was painted so frequently, there are ample opportunities to see her image today. I see one by Lautrec when I visit a friend’s print collection. A Vuillard painting of Misia was reproduced in the summer issue of ARTnews. And the Musée D’Orsay is currently offering Misia: Queen of Paris, an exhibition that gathered together portraits, photographs and correspondence related to her life. Maria Godebska Natanson Edwards Sert (1872-1950), Polish by birth, was a Parisian hostess and art patron. As the wife of Thadée Natanson, publisher of La Revue blanche magazine, she entertained artists and writers associated with the publication. Her second husband’s fortune allowed her to play hostess to “le gratin,” nobility and other swells, in her opulent apartment on the rue de Rivoli, a thematic point of interest for the D’Orsay’s curators who wrote, “The cream of Parisian society sought to be invited to her dinners and after-theater suppers.” Mallarmé, Valéry, Lautrec, Renoir, Bonnard, Vallotton, Picasso, Debussy, Stravinski, Richard Strauss, Diaghilev and Ravel were among the artists and writers included in Misia’s circle. Renoir loved to paint Misia, I know of three of his portraits, and I’m sure there are more. Supposedly he wrote her love letters which she claims she destroyed. 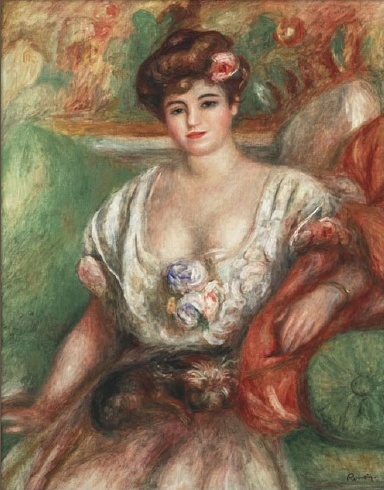 Renoir pleaded with her, she wrote in her memoirs, to fully reveal her breasts. Being elderly and arthritic did not stop him from wanting to see that gorgeous bosom, unsurprising for a masterful painter of creamy flesh tones. Vuillard’s correspondence reveals he was hopelessly in love with Misia at the time she was married to Thadée Natanson. The night Vuillard looked at her and began to cry, Misia decided, was one of the most beautiful declarations of love any man had ever made to her. 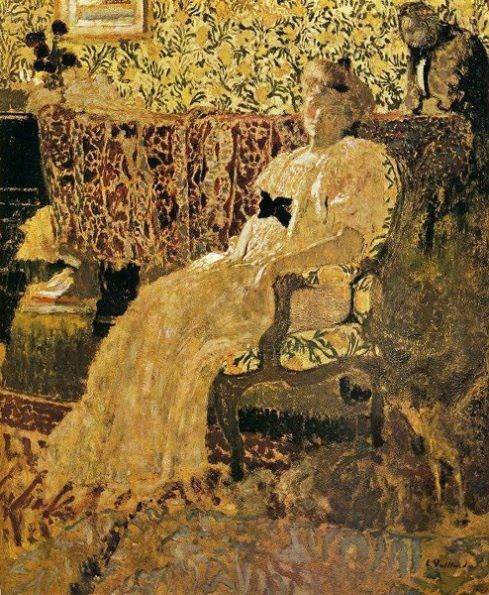 Vuillard’s adoration can be detected in the portrait below, in which the seated figure seems to be illuminated in a Belle Epoque interior rendered with depth distortion and unnatural coloring. Vuillard never married. Misis’a first divorce involved a questionable commercial arrangement between her first and second husband. Thadée needed money, and Alfred Edwards coveted Thadée’s wife. While Misia was blowing Edwards’ money, she was loosing him to his mistress the actress Genevieve Lantelme. Bonnard painted panels for her new apartment on the Quai Voltaire, and on them referenced a cat fight between Misia and the mistress over a pearl necklace. Lantelme was a piece of work. She attempted to seduce Misia while she was stealing Edwards. The actress died mysteriously on Edwards’ yacht, which brought Misia a bit of negative attention including a play about her life. Pierre Bonnard was not the only artist to gently mock Misia with his art. 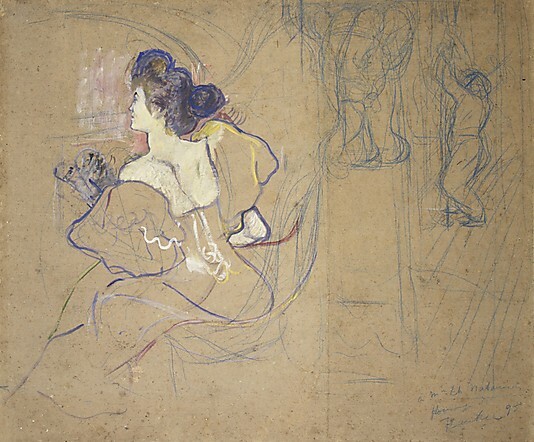 When she destroyed one of his portraits because she found it unflattering, Lautrec retaliated by portraying Misia as a brothel madam with prominent jowls and garish red hair. Art historical anecdotes indicate Misia tolerated the antics of the very inebriated Lautrec, until he made sexual advances towards her maid. (Misia’s) energy diverted from ballet to patriotism, she had obtained authorization from General Gallieni, the military governor of Paris, to form a convoy of ambulances to administer first aid as close to the front as possible; she persuaded the grands couturiers to contribute their idle vans, had their interiors refitted, and formed a team of volunteers that included Sert, Cocteau, Iribe, and a professional nurse, apparently the Madame Rumilly mentioned by Gide. Headed by Misia’s own Mercedes, which contained Misia herself, Iribe at the wheel, and Cocteau beside him “dressed by Poiret as a volunteer male nurse,” the convoy set off toward the firing line. The horrifying sights they soon met up with are described by Misia in her memoirs – the bodies of dead horses littering the roads, fragments of men and animals thrown in the air by explosives still hanging on the branches of trees. After that war Misia put on a gala in the Hall of Mirrors at Versailles. The next war illuminated a few cowards, which Misia and Cocteau, who attempted to rescue the poet Max Jacobs from the Nazis, certainly were not. Misia’s string pulling could not save Jacob’s life. What did Picasso do to help his friend? 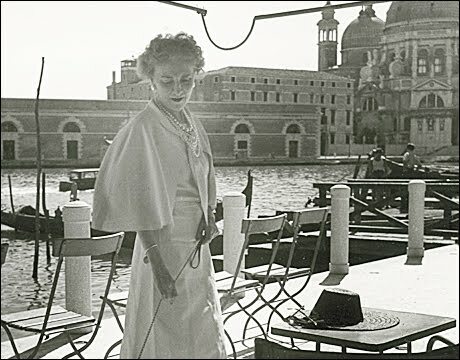 By the time Misia was finding Coco Chanel her clients and instructing her on matters of art and taste, her irreplaceable influence had spanned the disciplines of art, music, literature, dance, theater and fashion.